Anti-fracking activist group WildEarth Guardians (WEG) is out with another misleading public lands campaign, this time with the release of an interactive map that purports to illustrate “rampant” oil and gas related “major undesirable events” on public lands. You might recall that WEG’s public lands focus started earlier this year when it protested a Nevada Bureau of Land Management (BLM) lease sale. Oddly, the group expressed disappointment when the sale didn’t attract oil and gas producers. But that claim is simply false based on the incorrect use of the word “major” to describe each of these events. BLM defines “major undesirable events” to be spills of more than 100 barrels. The WEG map actually lists all “undesirable events,” which BLM defines as being 100 barrels or less. In other words, every spill reported to BLM since 2010 — even those small in volume and those that were contained on the wellpad with no environmental impact — is presented on this map as a “major” incident. Clearly, many of the incidents detailed on the map were relatively small, remediation was immediate and contained on their respective sites with zero environmental impact. But that didn’t keep the author of the blog from characterizing them as “disasters.” Although the word “disasters” was scrubbed from the blog post a few days after it was released, it remained in the authors’ tweets. Not only does WEG exaggerate the severity of the instances detailed on the map, it is clear that the group’s claim that the incidents are “rampant” is a stretch as well. The data collected by WEG finds there were 2,360 spills, fires and blowouts reported on federal lands since 2010. But WEG also reports there are 94,000 wells on public lands in the western United States, showing that spills are relatively infrequent compared to the number of wells in production. Furthermore, a recent E&E News report reveals that spills are declining rapidly not only on public lands, but throughout the U.S. E&E noted earlier this year that oil and gas related spills have fallen 24 percent from 2014 to 2016 at the same time oil production increased, showing that producers’ continued attention and commitment to safe operations are proving effective. E&E also noted in its recent story on the WEG spills map that, “Spills in BLM’s share of the U.S. oil patch account for just a fraction of oil field releases nationwide.” WEG’s data also reveals (inadvertently) that the overall trend of rapidly declining spills is occurring on federal lands as well, as there have been just 106 “undesirable” events on public lands so far in 2017, meaning such events are on pace to be far lower than the 372 reported in 2016. But as is often the case with the “Keep It In the Ground” movement, the actual data used to try to justify its extreme agenda does not stand up to scrutiny. Contrary to this activist fear-mongering, the industry is reducing spills and methane emissions on public lands while continuing to play a key role in boosting the economy for many communities in the west. For example, oil and gas production from federal lands contributed $1.6 billion in tax revenue to New Mexico’s annual budget in 2016— roughly 28 percent of its total budget. 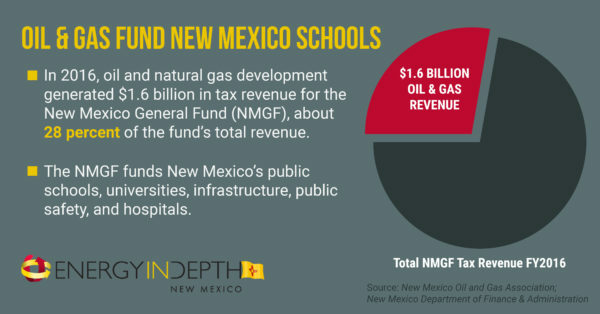 That revenue funds schools, hospitals and roads, and New Mexico’s oil and gas industry employs more than 100,000 people. It is a similar story in Colorado, where fracking on federal lands in Weld County generated more than $7 million dollars in grant money from the U.S. Forest Service from mineral extraction on the Pawnee National Grasslands in 2016. But despite the enormous positives oil and gas production on public lands brings to western communities, fringe anti-fracking activists groups like WEG will do anything to elicit fear in the public, even if that means fudging numbers and figures and — in this case — creating a misleading and misconstrued interactive “incidents” map.